alling like the blossoms on the cherry tree are the leaves of the pages of the history of the Comox Valley. It is a history most profoundly connected with the multi-cultural heritage of the original community of any substance: Cumberland. 1941. Among the victims of an unrepentant bias on the part of both the Canadian and provincial governments were the Japanese of Cumberland. Fortunately, however, there are those living in Cumberland and elsewhere that are not about to let this bit of cultural legacy die out completely. They are the members of the Coal Creek History Park Advisory Committee and they, along with assistance from the Village council and the Cumberland Museum, are continuing with their plans to complete a heritage park that includes the old Japanese No. 1 Townsite. Ray Iwaasa never actually lived in Cumberland in the years before World War Two—he came later, he says as a “curiosity seeker.” Although by the time of his birth his father had moved on to Alberta, he does have a connectedness with No. 1 Townsite, and the legwork he has done has proved invaluable, says Coal Creek Committee chair, Grace Doherty. His connectedness lies in the fact that Cumberland was his father’s first Canadian home. His uncle was the first in the family to arrive, and his father followed the uncle in 1898. When Iwaasa arrived in Cumberland in March 2004 he was asked by Mayor Fred Bates and the Village administrator if he would be interested in getting involved with the study commissioned by the Village to establish a plan to develop the Perseverance (Coal) Creek Historic Park site. He notes that he was the only visible Asian to be so involved. The irony of that being that the parksite would encompass the area that once contained both the Chinese and Japanese communities of Cumberland, equally vibrant in their day. Specifically, they wanted him to develop a vision for the No. 1 Japanese Townsite. Iwaasa agreed, but with obvious reservations arising from the fact, as stated, he’d not been born there, nor had he ever lived there. In those early days Iwaasa was put in contact with George Penfold who was in the process of completing his report: Cumberland Chinatown Japanese Settlement Historic Park Plan (released in August 2004). In that report Penfold expressed disappointment at the paucity of input from the former Asian communities. Needless to say he was delighted to be contacted by Iwaasa, and ultimately, following the release of the report an ad hoc committee was formed. That report was accepted in principle by the council in September 2007, and the members of the advisory committee, including by this point a more extensive representation from the former Asian communities, began meeting regularly in early 2008. Members include: Grace Doherty (chair), John Leung, Ray Iwaasa, May Gee, Joyce Lowe, Marie Lowe, Bernice and Katsaoki Takahashi, Tats Aoki (whose father was the principal of the Japanese language school, and whose mother was a teacher there), Josephine Peyton, Florence Bell, Carol Snaden, Dwayne Rourke, Tako Kiyono (who was briefly a resident of No. 1 Japanese Town), Imogene Lim, Donna Le May, Mas Aida and Lillian and Doug Tosoff. Iwaasa confesses that he “came in starry eyed” at the concept of the project, and was a little blindsided by how complex the political scene was in Cumberland. At times, she says, she felt they were being stonewalled and it seemed that the park vision might never be realized if they didn’t get the support needed. Then former mayor Bronco Moncrief came into the mix and his input on the matter of the parks was of huge import to the park proponents. According to Doherty, Moncrief told her he had walked down to the old Chinatown area and was struck by the beauty of the natural setting and told her he had come to the conclusion: “Why fool around any longer?” Moncrief had earlier told Iwaasa that he had lost a number of good friends when the Japanese were exiled in 1942, and he was motivated by their memory. In essence it is a 40-acre park with the Chinese townsite at the east and the Japanese to the west, with both elements to be connected by an Asian-style bridge across Coal Creek. Yet, what was it like in its glory days? At its high point up to 36 homes plus the two stores made up the community that was bounded by Coal Creek, the coal slagheap and the Wellington Colliery Railway. There was also a baseball diamond in the open space. Children attended school in Cumberland, and also attended Japanese language school six days a week. Over the years a number of Japanese merchants established businesses in Cumberland proper and Japanese women had a traditional tea garden at Comox Lake from 1914-1939. Yet, it wasn’t an easy life for the Japanese residents. The miners were paid at half the level of Caucasians in the same jobs and were the first to be let go when economic times were tight. Furthermore in what can be seen as nothing short of overt discrimination by officialdom, provincial legislation forbade them working in the pulp and paper mills, and the Oriental Exclusion Act of 1923 prevented them from working underground. In 1940 provincial legislation closed all Japanese schools, and this all culminated in 1942 when No. 1 Town (and No. 5 Town, to which many of the residents had moved when No. 1 mine was closed earlier) were evacuated to ghost towns in the Kootenays. At that time Japanese residents were forbidden to move closer than 300 miles from the west coast. This prohibition was to continue until five years after World War Two was over. Meanwhile, provincial authorities never returned the possessions and property of the Japanese who had been exiled. Ultimately, Weldwood of Canada, the later owners of the site, eco-gifted a 40-acre parcel of land, which included the No. 1 Japanese Townsite, to the Village of Cumberland in 2002. This was the first step in bringing the historic park into being. And fortunately, not all vestiges of the old town were completely eradicated. There remains the ‘Saito House,’ despite the earlier destruction of all the other structures. This is the original home of the Saito family. “The house is a historic treasure,” Doherty says. Built in the 1920s, it is destined to become the interpretive centre for the park. Meanwhile, Iwaasa points out that even though the structural devastation is nearly 100 per cent, there remain elements of the original settlement that are to be cherished, including 57 heritage fruit trees. Unfortunately, people, being as people are, had been dumping yard waste on the site, so that all had to be cleared away. Looking back in time, in it’s heyday there were 31 families, totaling 132 people, living at No. 1, with many in transition at any given time, as they moved on from the original site to other areas in the Comox Valley, such as the sawmill on Royston Road and Washer Creek in Union Bay. The Royston Lumber site still contains some of the original buildings and in its heyday was home to a small village. Much of the motivation for moving away from No. 1 was that the mine had shut down, and the settlers of the town were forced to find employment elsewhere. Some completely left the area—including Iwaasa’s father, who decamped for Alberta in 1908. His father had arrived in the area in 1898, some eight years after the original settlers. The Iwaasa Store was one of the two general stores at the settlement. As a consequence, he adds, the Chinese were treated much more poorly than the Japanese residents. That the Japanese had a big impact on the Cumberland community over the years goes without saying, Iwaasa notes. And in the years before the diaspora that came after Pearl Harbour fully a third of the population of Cumberland school was Japanese. There was also competition-winning Japanese baseball team. Living with his family in Alberta and not subject to relocation in 1942, Iwaasa wasn’t fully cognizant of the impact of what took place in coastal BC until an uncle from Cumberland and four of his children came to live with the family in Alberta. “It’s still painful to remember an older cousin and what happened to her,” he says. “She was a 19-year-old young woman whom I regarded as an older sister. She could never adjust to having been removed from her home. After some time with us she committed suicide—she drank lye. That happened in our home, and I’ll never forget it. I am sure there are many other similar stories. “When I was a kid, Cumberland could have been the moon,” he says. But, then, at a later date, he happened upon his father’s diary, which was meticulously kept and includes entries from his decade in Cumberland, from 1898 to 1908. “My father managed one of the stores. He also wanted to be an integral part of his new country, so he took his education at night school and when I was a child, even before I went to school, he was fluent in English,” he says. Iwaasa, now an integral member of the advisory committee, says that once the mandate of the group and the project had received its official sanction, things moved on in a productive manner. He adds that the committee now boasts excellent relations with the Cumberland Museum, an important factor in their quest to complete the park. The Cherry Tree Project, which culminated in the ceremonial planting of 31 flowering Mount Fuji cherry trees on October 24, 2009, was the first symbolic manifestation of bringing No. 1 Japanese Town to life. The 31 trees represent the families who still lived at the site in 1942, and came about thanks to a grant by the National Association of Japanese Canadian Endowment Fund, as well as donations by former residents and their families. The process was set in motion by Manabu Doi, a former resident, who made the initial application for the grant. going to work every day is a joy. David Bossom creates water features that are beautiful, easy to maintain and support plants and wildlife.or some people, owning a business is a mundane obligation undertaken with the sole purpose of paying the mortgage and putting food on the table. But for those lucky enough to have found true passion and purpose in life, going to work every day is a joy. David Bossom, owner of Island Waterscape & Design Ltd., fits into the latter category. Catch him standing in line to order a cup of coffee and he’s just your average Joe. But ask him about his business and his passion for creating beautiful ponds and waterscapes bubbles up like water in one of his fountains! When it comes to career choice, you would have to consider David Bossom to be more of a late bloomer—he didn’t grow up with a dream of creating award-winning watercapes. In fact, until about seven years ago, he had never even given them much thought. He laughs when he explains that he must give credit to a couple of turtles for forcing him to take a critical turn in his career and life path! Bossom began taking correspondence courses through the Okanagan University College and, after the pulp mill closed in 1998, he went back to school full time. He graduated from the University of Guelph’s horticultural program in 2000. He started working with his friend, Steve Royer, in a landscaping business. He eventually bought Steve out and started his own company, West Coast Garden Solutions. The new company focused on providing landscape maintenance and construction services for commercial and residential properties. By 2003, West Coast had secured contracts to service more than 100 customers and employed six people. One of those landscape maintenance contracts was for a property owned by Mike and Joanne Hamilton, of Hamilton Logging. The Hamiltons asked him to install a pond for their two pet turtles. Bossom had never built one but he set to work, engaging the services of a stonemason, Brian Stevenson, to help construct it. Bossom says that this was his proverbial “light bulb moment” where he knew he had discovered his passion. 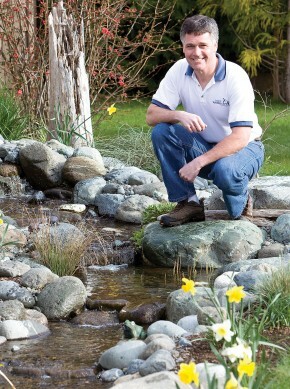 He went on a mission to learn everything he could about pond design and construction, eventually finding a company called Aquascape™ that offered a “Build a Pond in a Day” seminar in Vancouver. After attending this seminar, Bossom began fazing himself out of the maintenance part of his landscaping business and focused his efforts on the design and construction of water features. In 2006, he sold West Coast Garden Solutions and started Island Waterscape & Design. As Bossom’s business grew, his wife, Jane, began helping him with office administration on evenings and weekends. Her extensive customer service experience—gained from 17 years in municipal government and seven years in the non-profit sector—was a definite asset. In 2007, she was able to quit her regular day job to become the full-time office administrator and bookkeeper for Island Waterscape. Island Waterscape is a certified contractor with Illinois-based Aquascape Inc., the second largest water garden component manufacturers in the world. Through this affiliation, Bossom has had the opportunity to attend seminars and training conferences across North America, learning the trade from some of the most highly respected people in the industry. In 2009, Island Waterscape was recognized for his efforts as the Top Certified Aquascape Contractor in Canada. This recognition, in addition to his work, has also caught the attention of Canada’s horticultural community. Bossom is now also writing articles for Gardens West magazine. Whether you own a patio home that only has room for a bubbling fountain or an acreage that could accommodate a large pond with a waterfall, the installation of a water feature is an investment that pays off in improved property value, says Bossom. As an added bonus, water features are also good for your soul! Listening to the sound of moving water can help reduce stress and taking a few minutes every day to spend time in silence watching fish swim lazily about can be very relaxing. Large or small, Bossom and his crew put a lot of time, effort and TLC into every project. For most backyard projects, the digging and land contouring is done manually and most of the rocks are set into place one at a time. A special EPDM (ethylene propylene diene monomer) synthetic rubber liner is used in all Island Waterscape designs. Unlike some materials that have been traditionally used for pond liners, EPDM is very flexible, has a strong resistance to tearing and is non-toxic to fish and plants. It also has a 20+ year life expectancy when exposed to ultraviolet rays from the sun. When it is covered with rock and gravel, it can last about 75 years. But the real magic behind every Island Waterscape masterpiece is completely hidden from view. The soul of every water feature is the plumbing and filtration system that aerates and filters the water to ensure it is clean, fresh and biologically balanced so fish and plants both thrive. No need for water test kits and chemicals. Once established, an Aquascape™ water feature is almost maintenance free. While the all the hard work over the years has paid off, it also helped that Bossom is well connected in the Comox Valley. He was born in Comox and his parents, Alec and Diane, were business owners in Courtenay from the mid-1950s until the mid-90s. (They have been retired for years but still call the Comox Valley home.) Brothers Rick and Mike also live here and his sister, Linda Lemieux, is not far away. His uncle, the late Fred Bossom, was also well known here for his role in building Comox Valley Insurance, now called InsuranceCentres Vancouver Island. All of them provided much-needed support and encouragement as he embarked on his new enterprise. Since 2006, Island Waterscapes has constructed more than 200 ponds, streams and waterfalls from Victoria to Campbell River. With construction projects ranging from small backyard ponds and bubbling fountains to a 55-foot-long stream and a massive waterfall with more than 30,000 gallons per hour cascading over the top, Bossom and his crew of three have the experience to build any waterscape you can dream of. In an effort to meet the needs of their ever-growing client list, the Bossoms took a chance last spring and opened a water feature showroom in the garage of their home. This spring, Island Waterscape is going through yet another metamorphosis. They recently moved the showroom away from their home and opened a new retail store that is being managed by Jane—Copper Turtle Landscape Connections. The store features Island Waterscape’s water garden products and accessories from Aquascape™, as well as gold fish, fish food, wind chimes, birdhouses, bird feeders and seed, rain chains and much more. They are also very excited to introduce a new product called RainXchange, a unique rainwater harvest system facilitates the capture and re-distribution of rainwater through a decorative water feature. —The Copper Turtle is located at TruLine Masonry and Landscape Supply at 2750 Cumberland Road in Courtenay. TruLine’s complete line of retaining wall blocks, decorative rock and patio pavers will continue to be manufactured and sold onsite, but the store and yard are undergoing a major renovation. Over the spring and summer you will see big changes at this location. Bossom and his crew intend to gradually transform the front lot into an outdoor showroom that will, of course, feature a number of his spectacular water features and showcase both Aquascape™ and TruLine products. The public will be invited to come and learn how to build a pondless waterfall, patio, retaining walls and more through a series of hands-on workshops to be held at TruLine in the coming months. Dates and times for the various workshops will be posted on the Island Waterscape website.